Before the middle of the 19th century, the most common writing implement was the quill pen dipped in ink. Quill pens were made from the feathers of geese or other large birds. The next innovation in writing instruments was the steel-tipped pen, which had been invented around 1780, but did not come into commercial production until the 1820s. By the 1840s, use of the steel-tipped pen became widespread. Pens with steel nibs remained common until the 1940s, when they were gradually replaced by self-filling fountain pens, and the inexpensive ballpoint pen. 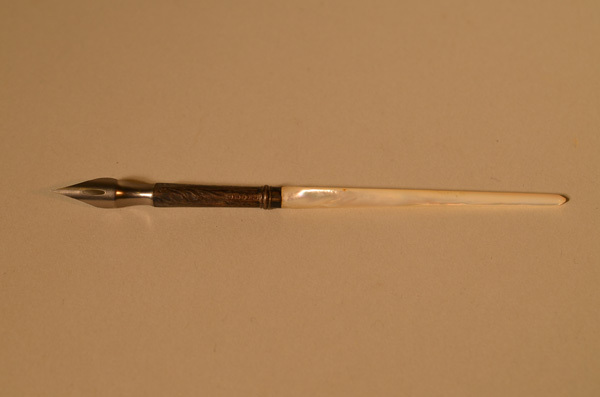 According to records, this pen was a wedding present to Annie Elizabeth Newby from the bookkeeper at Fort Edmonton. Annie married John Walter in Chief Factor Richard Hardisty’s home on October 21, 1886. Located at the bottom of Walterdale and Queen Elizabeth roads, on the north side of the Kinsmen Sports Centre parking lot.